Complex Says: A ‘50s Corvette is a beloved classic car for sure, with the Art Deco side coves, often two-tone or in the “polo white.” Fun fact: This homegrown ride is the first and only mass-produced American sports car. The ’58 was the first year for quad headlamps, and it featured some trick exhaust pipes that exit via the bumper. It was also equipped with a fast and innovative engine that had an optional fuel injection system, along with an exclusive “wonder bar” radio that was always mounted vertically in the dash--a famous feature. A classy choice (right) to have in a collection, but it did look a little out of place among Escalades and modern Ferraris. The Vette is still the most popular American sports car. 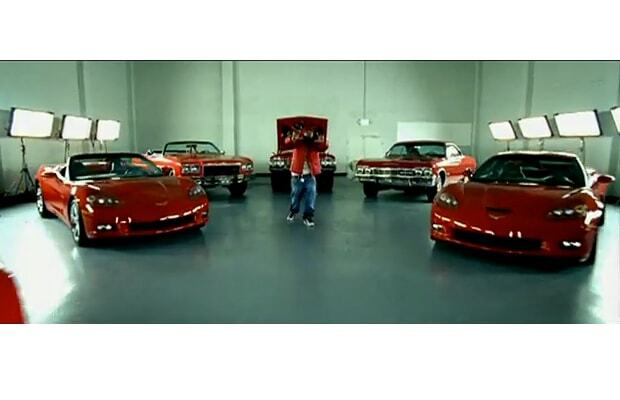 The more modern design is seen speeding around a parking in the "Get Your Roll On" video.